Colorado School of Mines | What's Happening in Golden? Today’s Van Tuyl Lecture at the Colorado School of Mines features Alexei Milkov. His topic is Randomness, Serendipity and Luck in Petroleum Exploration. The lecture takes place from 4-5PM in rm. 241 of Berthoud Hall. Learn more…. Last week’s ED Talk on the Aspen Mining District was rescheduled to today (January 31st) at 4PM Ed will be in the Boettcher Room of the Arthur Lakes Library. Learn more…. 9:30-11:30 OLLI West will present speaker David Maloney at the Unitarian Church, 14350 W. 32nd. His topic will be Forensic Science: Past, Present Future? This presentation will summarize what forensic science is and is not. It will include a brief retrospective account of the field, the current status, and what the future holds. The presentation will explore what forensics in the state of Colorado looks like and will finish with trends in drug analysis, DNA, and crime scene investigation. Guests can attend one presentation for free. To attend additional presentations please contact Susan Schmetzer for arrangements, susanolliwest@gmail.com. 1-2PM Highlights Tour of the Railroad Museum. Cost is $3 in addition to regular admission. Learn more…. 4-7PM Winter on the Rocks Pre-Party at Nomad Taqueria + Beer Garden, 18485 W. Colfax Avenue, Golden, CO (map) (Red Rocks Origin Hotel) Help us welcome the first Red Rocks show of 2019 with a pre-concert bash! Sponsored by Oskar Blues, we’ll pour two-for-one Icy Pale Ales, a limited-release IPA brewed especially for the 8th annual Winter on the Rocks. Wash down our “God Loves Fugli” taco – a beer-braised pork taco with Oskar Blues’ Fugli IPA, pickled onion, grilled pineapple and cilantro – with a variety of brews, and get down to live music before heading to the concert venue. Speaking of, the Oskar Blues trolley will provide complimentary transportation to and from Red Rocks! Tonight’s Art on Tap at Foothills Art Center will feature the GoFarm team. They’ll teach participants about local farming and create some veggie inspired art. 6-8PM. This is a 21+ event. Admission is free for Foothills Members. Non-members pay the normal admission price. Congratulations to this year’s graduates from the Colorado School of Mines! Commencement for Graduate Students takes place this afternoon at 5PM at Lockridge Arena. The undergraduate ceremony will take place tomorrow morning at 9AM at Marv Kay Stadium. Party at the Visitors Center! Plan to drop by the Golden Visitors Center this afternoon between 4:30 and 7PM. This is a combination Community Social and Volunteer Fair, so many of the Golden Cultural Alliance organizations will be there to tell you about volunteer opportunities. It’s going to be a great time with food, drink, and entertainment courtesy of the Colorado Cowboy Gathering, featuring Rex Rideout! City Council meets tonight at 6:30 in City Council Chambers. They will review the final PEL (planning and environmental linkage) report completed by the WestConnect Coalition and CDOT. They will also review the final engineering report that reviewed Heritage Road and make recommendations. Tonight’s consent agenda sets May 24th as the date to discuss a rezoning request that will allow the School of Mines to construct a new Residence Hall between 18th and 19th Streets/Elm and Illinois Streets. The current R-3 zoning restricts building height to 50 feet; thus, the request for rezoning. The new building is designed to be five stories and 64 feet high. Rooftop devices such as chimneys, ventilators, or solar panels may add up to 5 feet more. The new building will include 416 rooms. The May 24th agenda will also include a rezoning request made by the residents for the properties located at 602, 606, 609 And 610 6th Street And 600, 610-612 Ford Street from R-1, Residential Standard Lot, To R-2, Low Density Multiple Household at the property owners’ request. The proposed new Short Term Rental ordinance will also be discussed on May 24th. Learn more by reviewing the meeting packet…. Big Ring Cycles will have two group road rides this evening, leaving the shop at 6PM. Learn more…. From 6:30 to 7:30 they’ll be demonstrating e-bikes. Curious about electric bikes? Electric bikes make all sorts of things possible. Hills disappear. Miles disappear. Grown-up behavior disappears! Fun and long rides with friends and a permanent tail wind can be yours. At this info session we’ll show you around the different styles of e-bikes and point out what you need to know. Bring your questions. Bring a friend. Light snacks and drinks provided. Jim Smith of Golden Real Estate is sponsoring two community garage sales this Saturday, May 12th–one in Stonebridge and one in Mountain Ridge. Click the links to see which households will be participating. Jim will keep updating the list as more households join in. I hope everyone has had a chance to enjoy the School of Mines’ E-Days celebrations. Ace Photographer Dave Powers got some fun photos of yesterday morning’s cardboard boat race. You can see them on our Facebook page. The final E-Days event takes place this morning–the Pi Phi Pancake Phiest in the Student Center Ballrooms, from 10AM-noon. Learn more…. The Railroad Museum continues their Open Car Sundays today. During the month of April, they have docents available from 10AM to 12PM and 1-3PM to show you through railcars that are normally closed to the public. Stop by today to see Denver & Rio Grande Western F-Unit Diesel Engine No. 5771, Rio Grande Southern Business Car “Rico,” and Chicago, Burlington & Quincy Business Car No. 96. Learn more…. The Rotary Club of Golden has organized a Community Wellness Fair to be held at Golden High School on April 28, 2018 from 9:45AM to 3PM. The purpose of the Fair is to provide and identify resources for children and teens who are dealing with mental health issues, particularly within their own family, as well as anyone interested in learning more about mental well-being. The Fair is free, open to the public, includes classes, presentations, food, entertainment, games, prizes and other activities designed to attract a broad audience. Twelve classes designed for both children and parents will be given by mental health professionals on subjects such as anxiety, bullying, substance abuse, and other important topics. 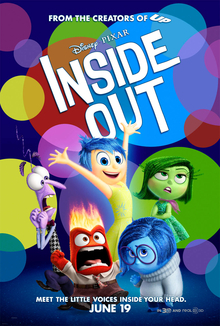 The Fair also includes a presentation by JC Jackman and a showing of the Disney film Inside Out. For more information, visit goldenrotary.org/fair or download the event flyer. The School of Mines is having their annual Helluva Service Event on Saturday, April 7th from 8AM-1PM. This is a great event! A team of volunteer students will come to your home, business, or non-profit organization and take care of jobs for you. Do you need some painting, raking, or moving done? They’ll do it! Your project must be within walking distance of the campus or along the 16 bus line–no transportation is provided. The volunteers will be available to start walking to their projects at 8:30AM and must be back at the campus by noon. Learn more on the Helluva Service Event website. Are you wondering where they came up with that name? Check out the lyrics to their School Songs. First, Foothills Art Center tells me that they have discontinued Toddler Tuesday, so if you were thinking of going there this morning, don’t. Second, though the City website showed a Historic Preservation Board meeting last night, they didn’t have one. They’re showing a Mobility and Transportation Advisory Board meeting tonight at 6PM, but they have not posted an agenda, so I’m guessing that one won’t take place either. I’m more confident that there will be a Planning Commission meeting tomorrow night at 6:30 in City Council Chambers. They will consider two special use permits for people wanting to have Tourist Home status. City Council recently put a moratorium on new Tourist Homes, but these two had already applied, so the city is letting them complete the process. The two homes are at 1107 11th Street and 154 Washington Avenue. The major topic for the night will be a request by the School of Mines for a change in zoning and approval of a development plan for a new Residence Hall between 18th and 19th Streets/Elm and Illinois Streets. The current R-3 zoning restricts building height to 50 feet; thus, the request for rezoning. The new building is designed to be five stories and 64 feet high. Rooftop devices such as chimneys, ventilators, or solar panels may add up to 5 feet more. The new building, which will include 416 rooms, will replace the parking lot west of the Starzer Welcome Center, resulting in the loss of 70 parking spaces. According to the Golden Municipal Code, 416 rooms require 139 parking spaces. The School says that the campus will have an adequate number of spaces when including the planned new parking garage on 14th Street. For more information about the cases to be discussed at the Wednesday night Planning Commission meeting, see their meeting packet. The School has plans for still more new residence halls, including one on the vacant lot across from Safeway, at 18th and Jackson. They are hosting a neighborhood meeting to gather public input on their Master Plan from 5:30-7PM this Thursday, March 8th, at the Starzer Welcome Center – 1812 Illinois Street (map). The Colorado School of Mines is developing a new master plan in conjunction with the MINES@150 plan. Mines will hold the first of three neighborhood meetings over the next several months, to gather public input for the master plan. Enter on the north side of the building from 18 th St. Upon entering, the meeting room is to the right. Parking is located in lot E on the west side of the building. Parking is free after 5 p.m.
Of course, summer break will be here before you know it, and some of the most popular camps are filling already. We have some absolutely amazing options in Golden, including many programs offered by the School of Mines, hands-on history offered by the Golden History Museum, art camps at Foothills Art Center, a theater program offered by Miners Alley Playhouse, a chance to learn about trains and railroading at the Railroad Museum, athletic camps, chess camps, quilting camps…the list goes on and on! We maintain a page all year round, listing the upcoming camps and classes. Visit it, and start planning! The Library will have an open house tomorrow (Monday March 5th) from 4-5:30PM with representatives from several summer camps on hand to tell you about their programs. Learn more…. Golden United will hold the second in their series of community conversations tomorrow night at 6PM at Schnepf’s at Fossil Trace, and you are invited. During these monthly gatherings, folks will meet to talk about issues of interest, starting with brief remarks on a topic defined in advance. Given the recent Florida school tragedy, Steve Jensen, the Chief Deputy District Attorney will speak to school safety and gun violence along with broader justice issues during his remarks. Steve has deep experience on these topics as he was a chief prosecutor of the Columbine and Deer Creek school shootings. To help us prepare for the meeting, we encourage you to register here for this discussion. Please join us for dinner. Not required. If dining, you can choose from options starting at $14.00 and up. Don’t forget, if you need childcare, you can contact Pastor Amy Strader to make a reservation. One week from today we’ll be back on Daylight Saving Time. On Sunday March 11th, the sun will rise at 7:17AM and set at 7:02PM.